Terri and I have just returned from an incredible two weeks in New Zealand. I must say that when we departed on the trip I was expecting the golf to be good, but not much more. How wrong I was! I was truly blown away with not only the quality of the golf courses (design and shot-making), but also the scenery and conditioning. We started on the South Island at Millbrook. Here we played the Coronet and Remarkable nines as there are 27 holes available. Conditioning and scenery was superb and the consensus was that everybody preferred the Coronet nine. A good idea here is to tee it up relatively early and then drive 5 minutes up the road for a fantastic lunch at Amisfield Winery. Our second course on the South Island was Jack's Point. This is the most beautiful golf course I've ever played. Not only is it beautiful, but it's a top notch layout too. A true 360º course - look in any direction, on any hole, and you'll see incredible beauty. Our group literally couldn't get enough of Jack's Point and this was the course of the trip for me. We then moved to the North Island where the next round we played was at the mighty Kinloch Club. Our weather was perfect and we just about had the course to ourselves. A Jack Nicklaus design with a definite linksy feel to it - Kinloch delivered the goods and more. I loved how the fairways incorporated the humps and bumps and the whole look and feel of the course was interesting. The golf course is fantastic, but the Lodge at Kinloch might even be better. Contemporary accommodations along with world-class cuisine is tough to beat. The day after Kinloch we ventured to Wairakei Golf Club. While the weather was a little dreary during our time there, I was pleased to see how many of the golfers in our group enjoyed the course. Wairakei is a "proper" golf course as I like to say and there was not a single hole out there that I wouldn't want on my home course. I did feel it was a little too big for the ladies as the ladies tees were not forward enough. Fabulous golf course that I could play everyday. The course our group was most excited to play was definitely Cape Kidnapper's. Unfortunately we had horrible weather for our round there, but we all gained a sense of how much fun this course could be on a pleasant day. We caught glimpses of the stunning scenery and it seemed to whet our appetite to return one day and appreciate all this beautiful site has to offer. Beautifully designed by Tom Doak, Cape Kidnapper's allows for the influence of weather and wind without becoming too challenging. I wrote in the guest book, "A very enjoyable and wise design!" Cannot wait to get back. A Long Swing or a Short Swing? I do typically prefer slightly longer swings over shorter swings, but above all else I prefer swings that work. If you look at the greatest players of all time you'll see significantly more long swings than noticeably short swings. I have also found that longer swings will typically produce faster club speeds. Never a bad thing! Keep in mind that these are generalized ideas that have been found to work on the students I have been fortunate to coach over the years. They have also been verified by other coaches and a scientist or two, but they are not set in stone. The objective is always improved performance. All of the six balls pictured above were struck with a putting robot and the exact same stroke. The three circled/striped balls were hit with a variable depth grooved putter, with one being hit out the center, another 0.75" out the heel and the other 0.75" out the toe. The three non-circled balls were struck in the same fashion, but they did not have the advantage of the variable depth grooves. Notice the massive difference in dispersion! We all hit off-center putts. We all despise three putts. The answer seems pretty simple to me! Please know, this is not a sales pitch for Ping putters, but before you go out and buy your next golf club learn about the science behind the design. There are literally thousands of articles pertaining to getting rid of slicing or fading the golf ball, yet not much sound information to help golfers overcome hooking (and blocking)! Give this simple drill a try if you tend to struggle with blocks and hooks. If you enjoyed this video and article please share it with a friend who you feel might benefit from it. In this series on practice I have mapped out a plan to help each golfer take ownership of their technical upgrades (SWING), dedicate a portion of the valuable practice time developing skills by hitting unusual and ‘outside the lines’ type shots (SKILL) and now the time has come to bridge the gap between the practice ground and the course by turning our attention purely towards results (SHOT). With this mode of practice there should be a constant changing of clubs, targets, lies and intent. Here the golfer should incorporate their pre-shot routine as they hit specific and on-course styled shots. Don’t attempt crazy or unusual shots; we’ve already done that in our skill session. 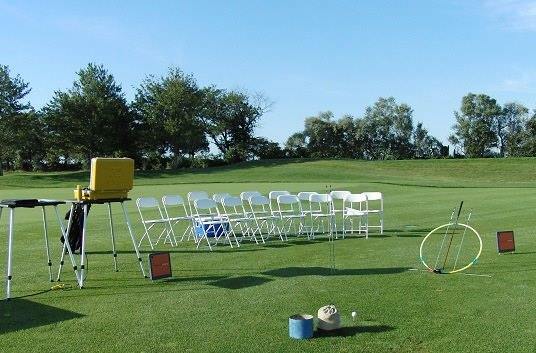 It’s time to step back inside the lines and play your go-to ball flight. For an added challenge you could even keep yourself accountable and see how many consecutive shots you can hit to the appropriate side of a target. Everything about this practice mode should simulate real, on-course golf. Play golf! This drill is great fun for golfers of all abilities and ages. All you need is a can of Dr. Scholl's Odor X foot spray. I firmly believe we become better at completing any task when we learn to complete it a variety of different ways. Shot 1 is outside the vertical line, shot 2 inside it and shot 3 is on the line. When taking on this challenge you want to use a 6 iron and try to hit the biggest hook or slice possible for your opening shot. From there the objective is to progressively reduce the amount of curvature until you get to a straight shot. If you can get 9 shots, as in the example above, you're doing very well. This is the first in a series on how to get the most out of the limited available time you have to work on your game. I'm a big proponent of allocating a portion or your practice time to taking ownership of mechanics and SWING, another portion to SKILL development and finally executing SHOTS to carry the upgrades to an "on-course" styled environment. Each session should be filtered through the swing, skill and shot mantra. Make sure that to avoid the trap of trying to hit result based shots while you're attending to mechanics - that will come later. Check back next week where I will share my take on how to develop your skills as a golfer. Trip Update: I have an opening for one more couple to New Zealand in February 2017 and space for a few more couples to South Africa in January 2017. Should you be interested check out www.syncexcursions.com or shoot terri(at)andrewricegolf.com an email. Would love to have you join me! Predictability! A word I use every day on my lesson tee. We don't need perfection, although that would be nice, we simply need to predictably launch and shape the ball and we can play the golf of our dreams. The following sequence of Graeme McDowell illustrates beautifully how to set up the transition and ensuing downswing for exactly what we are looking for through impact. To get started with predictable, controllable draws you simply must work the hands in while the clubhead travels out through the strike. Thanks for reading and if you have a friend who might be struggling with this please share. If you're interested in join me on a Golf Safari to South Africa this January with your loved one please contact terri (at) andrewricegolf.com or visit www.syncexcursions.com for more details. As we all know most golfers tend to struggle with fading and slicing the ball, but there is a large portion of the golf population, typically lower handicap players, that struggle with hooks and the occasional block. This article is for you! The objective here is to get the clubhead traveling less outward and along a more neutral path through impact. Getting your body to rotate on the way down in more of a 'merry-go-round' fashion and less of a 'ferris wheel' fashion will deter the clubhead from getting too far to the inside. Try this feel slowly and with soft shots before working up to full swings. You'll be amazed at how challenging it is to actually stay back and rotate versus driving forward. Stick with it and realize that in order to improve the quality of your shots you're going to have to improve how the clubhead communicates with your golf ball. Thanks for reading and if you have a friend who you feel might benefit from this information please share! South Africa or New Zealand in 2017? What's it going to be? Once again Terri and I will be headed to South Africa this coming January for our 11th trip and as per usual we cannot wait to get back. We have changed things up slightly from years gone by in that we now start our trip in Cape Town and close things out at the world renowned Makanyane Safari Lodge. We will spend five luxurious nights at the Cape Grace Hotel which was recently ranked in the top 100 hotels in the world by Travel & Leisure. Of course there is golf at three of South Africa's best, but so many traveler's overlook the country's incredible food and wine scene. We complement the Cape's stunning scenery with private wine tastings at Hamilton Russell and Fairview and our final dinner at Delaire Graf will definitely be one to remember. We then head to the northern part of the country for the safari leg of our trip. Here are private air charter lands at the Madikwe Eastern Airstrip and our 5 day bush adventure kicks off. Your life will never be the same again after your time here! The staff, food, accommodations and customer service are all simply world class. And then there's the game viewing! We have often seen the magnificent seven (lion, rhino, elephant, leopard, buffalo, wild dog and cheetah) on our previous trips and almost expect to see all the members of the Big 5. We currently have space for four additional couples on this incredible life-changing trip. Please contact Terri at terri(at)andrewricegolf.com should you have any questions. Also visit www.syncexcursions.com for a detailed itinerary. In February we head to the southern hemisphere again - this time to New Zealand! It is kinda nice to trade two weeks of winter for some summer sunshine. We will spend time in all the best spots on both the north and south island visiting Auckland, Queenstown and Millford Sound, Napier and Lake Taupo. You will have the option to play five spectacular rounds of golf at courses that include Cape Kidnapper's and the top-rated Kinloch Club. For those seeking adventure we have included a charter flight and cruise on the Millford Sound and jetboating on the Shotover river. Everybody loves great food and wine and New Zealand has plenty to offer. We will enjoy private tastings and culinary delights at Amisfield, Craggy Range and Mission and Church Road wineries. We currently have space for three additional couples on this Kiwi excursion. Please contact Terri at terri(at)andrewricegolf.com should you have any questions. Also visit www.syncexcursions.com for a detailed itinerary. Thanks for reading and if you cannot join us in 2017 we hope to have you come along in 2018! Is Your Swing Built on Timing? We've all played those rounds where we have 14 solid holes and 4 holes where it seems as if we've never held a club before. This is a classic indication that your golf swing is reliant on timing. A situation where the face angle at impact is determined by the golfer "manually" inputing clubface closure through the impact zone. If you can work towards making the "motorboat" curve around the corner you'll become much better at getting the "tube" to fling around - this way positioning the clubface appropriately through the strike will start to become more automatic and your swing will be less reliant on timing. Ideally the handpath should be traveling inward and upward. Get to work on the proposed drills and you'll start to see a decreased reliance on timing and improved consistency out on the golf course. Thanks for reading...and watching! Place an empty sleeve box between a teed golf ball and the target as indicated. The box should be approximately a grip length ahead of the ball. On a windy day it might be necessary to use tees to anchor the box in place. This is a costly addition to this drill! If you can hit shots without running the clubhead into the box then chances are that you're no longer hitting down on the ball and you should see an increase in both distance and the altitude of your tee shots. Keep in mind that as you "upgrade" your attack angle, should you have an adjustable driver, you might need to alter the loft. Thanks for reading and I hope these ideas are going to help your game. Cheers! The exact same ball speed with more than 7 mph less club speed! The spin loft, which is not an easy change to make, has gone from 31.1º to a slightly low 24.8º and the height has come down to a more manageable 76 feet. I anticipate that as this golfer works to get comfortable with their new feel they would increase their compression to a more appropriate 26º or 27º. Coach Camp 2016 was a tremendous success and now you have an opportunity to learn from all the presenters as if you were there. From trending #1 on Twitter to all the rave reviews we've received I believe that whether you're a golfer or coach you will benefit from the information shared in seven plus hours of presentations available here. The videos are broken into segments but unfortunately do not include Scott Fawcett's presentation as he opted to not include his proprietary information. The cost is $150 and is payable once you have registered at www.coachcampvideo.com. The videos will give you insight into what some of the top coaches and minds in the game of golf are working on to improve their students performance. They include individual presentations from Martin Chuck, Dana Dahlquist, Joe Mayo and Andrew Rice. Our guest presenters, Dr. Morris Pickens and Matt Wilson and Corey Lundberg from Curious Coaches are also featured. Perhaps one of the most insightful segments is the lesson evaluation each feature presenter did with 10 handicap golfer Karl Deblitz. There are also in depth discussions on wedge and driver play. I am confident that whether you're a golfer looking to improve your ball striking or coach looking to advance the quality of your information you will find these presentations to be immensely helpful. One veteran attendee echoed the sentiments of many others when he said, "This was the best education experience I have ever attended!" It has come to our attention that privacy protected videos will not currently display properly using the iOS 9.3 system or Safari 9.1 on Mac. This is a known issue with Apple that was caused by their latest update, and they are currently working to fix it. On your Mac, you may use a different browser or an earlier version of Safari. Unfortunately, your iOS device running 9.3 will not be able to display these videos properly until Apple releases a new iOS update. We apologize for any inconvenience to our iOS 9.3 and Safari 9.1 users, Apple is working to correct the problem. Here's an image from a recent lesson with a golf professional that has always had a tough time getting his right arm to rotate properly in the backswing and as a result he's had to do so much in order to shallow the shaft. The before is on the left and the tray drill example is on the right. It's amazing what this simple drill can convey to any golfer who struggles to get their trail arm in a good spot leading into the downswing. Thanks for reading! There is so much information out there regarding the golf swing that it's nearly impossible for anybody to sift through it all and decide what could be a game-changer for their game. In this article I've done the heavy lifting for you and trust me, improved wrist angles (particularly in the downswing) can make a massive difference in your ball striking. If you do this correctly you will sense an improved ability to hit draws and the additional compression will have the ball jumping off the clubface. Give this one a go!